Is There a Treatment for Hyperparathyroidism? What Is the Prognosis of Hypoparathyroidism? Hyperparathyroidism is the result of an overproduction of a hormone called parathyroid hormone (or PTH) from the parathyroid glands. 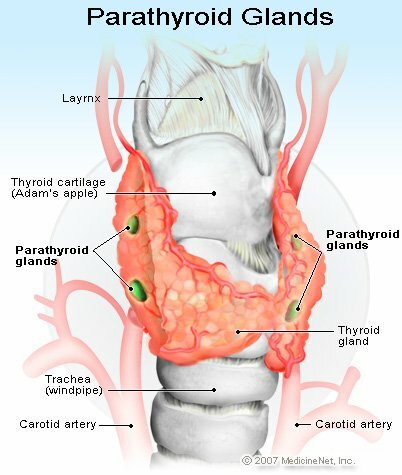 The parathyroid glands are four small glands that surround the thyroid and are found in the anterior part of the lower neck. They are about the size of a pea. Occasionally, they may be in different locations because of the way the glands develop, but the location (embedded in the thyroid for example) does not itself affect the function of the gland. The main job of the parathyroid glands is to regulate calcium levels in the body. If calcium levels are low, PTH levels increase. If calcium is high, PTH levels are reduced. Calcium is a mineral that is important in the regulation and processes of many body functions including bone formation, hormone release, and muscle contraction, as well as nerve and brain function. The thyroid's production of PTH regulates calcium by influencing absorption in the GI tract, excretion in the urine, and release from the bones. If too much PTH is released, calcium regulation is disrupted, and calcium levels in the blood increase through the mechanisms noted above. There are three main types of hyperparathyroidism. Primary hyperparathyroidism means the underlying problem starts in the parathyroid glands. Secondary and tertiary hyperparathyroidism means that another disease in the body has caused the parathyroid glands to be overactive. In secondary hyperparathyroidism, there is a signal to the gland to produce more parathyroid hormone (for example, a low vitamin D level). In tertiary hyperparathyroidism, the glands continue to over-secrete parathyroid hormone even though the signal is gone. These conditions may be seen in kidney disease. This article focuses on primary hyperparathyroidism. Hyperparathyroidism is not an uncommon disorder. It is more common in women, and in the older population its incidence can be as high as 1 in 1000. In the majority of cases the cause of hyperparathyroidism is not known. In most people, hyperparathyroidism occurs sporadically. In some cases, however, there can be a genetic basis for developing the disorder. A rare inherited syndrome called familial multiple endocrine neoplasia type 1 (MEN I) is associated with hyperparathyroidism. In some cases, all four of the parathyroid glands are somewhat enlarged and secrete excessive amounts of hormones. This is referred to ashyperplasia. In other cases, one of the four glands functions autonomously, and produces excessive hormone on its own. Usually this gland is enlarged and is referred to as anadenoma (a type of benign tumor). Because the clinical findings seen in hyperparathyroidism are due to hypercalcemia, the symptoms are the same as those of hypercalcemia. Excessive calcium may cause high blood pressure or hypertension. Symptoms are often described as "moans, stones, groans, and bones". If a person experiences any of the symptoms above, particularly if they are recent (not experienced prior) and he or she has multiple symptoms, it is worth seeking medical attention. The diagnosis of hyperparathyroidism is made by blood tests. If the results of the blood tests reveal that the calcium levels in the blood are elevated, and the blood PTH levels are also inappropriately high for the serum calcium, the diagnosis of hyperparathyroidism can be confirmed. While there can be other causes of high blood calcium (hypercalcemia), this finding combined with the high PTH level confirms the diagnosis. A 24-hour urine examination may also be ordered to confirm an increase of calcium in urine. X-rays of bone structures may reveal fractures and other changes in bone. Abdominal imaging may also reveal evidence of stones in the kidney, ureters, or bladder. Thiazide, a specific type of diuretic that may be prescribed for patients with very high calcium levels. Calcimimetics turn off the action of PTH. Physical activity, moderate vitamin D and calcium intake should be coupled with monitoring disease progression with tests such as serum calcium, creatinine, and bone density. Surgery is indicated if the patient has very high calcium levels, or if the person is symptomatic with renal stones, multiple fractures, or has osteoporosis or bone rumors. Follow-up should be discussed between the patient and the physician. If medical management or observation is the plan of action, regular visits a few months apart should be scheduled, with immediate assessment if symptoms worsen. If surgery is planned, preoperative assessments will be necessary, in addition to imaging studies to localize which parathyroid gland is involved. Postoperatively, visits are frequent in the first few months. Once stabilization has been achieved, follow-up visits will be less frequent. There is no prevention for hyperparathyroidism. In the case of primary hyperparathyroidism, the outlook is positive with both medical and surgical management. "Primary hyperparathyroidism: Diagnosis, differential diagnosis, and evaluation"
What was your experience with symptoms of hyperparathyroidism? How was your hyperparathyroidism treated? What methods were most effective?